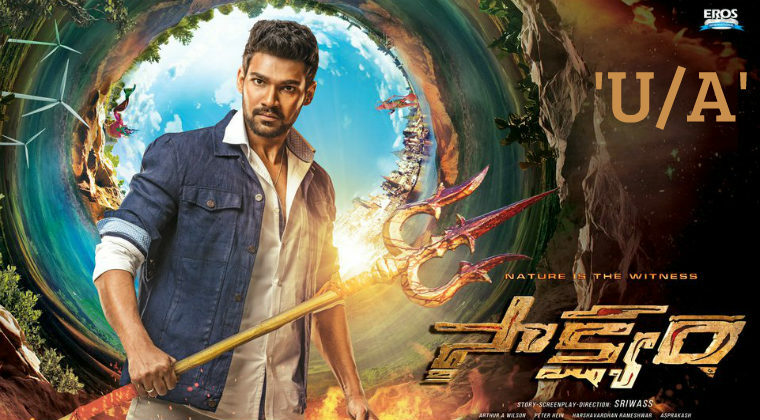 Coming with a tagline “No escape from Karma,” Saakshyam is all set to hit screens Friday. Director Sriwass has come up with a concept thriller on five elements of nature. Bellamkonda Sai Srinivas is looking uber cool with his trendy makeover. Pooja Hegde sizzles with the young hero. The film’s trailers and songs are getting thumping response. Here we have Saakshyam movie pre review. Saakshyam is a fantasy thriller with devotional backdrop. Going by the trailers, the film is extravagantly made with whopping budget. The film is expected to have Hollywood style action episodes. Makers promise high technical standards. Peter Hein master’s action choreography is big asset for the film, besides excellent graphics. The film is extensively shot in New York, Grand Canyon and New Jersey. Saakshyam has been acquired by Eros Internation for 35 crores. Saakshyam has been given U/A certificate by Censors. CBFC members appreciated the movie. Cinematographer Arthur A Wilson is shooting the film in exotic locations. Harshavardhan Rameswar composed music will another highlight. The film also features Jagapathi Babu, Meena, Sarath Kumar, Ravi Kishan, Meena, Vennela Kishore, Jayaprakash, Pavithra Lokesh, Brahmaji, Ravi Kishan, Ashutosh Rana, Madhu Guruswamy, Lavanya etc.